Connections-based Learning: Connections-based Learning, Connected Learning, Connected Education, Global Ed. Any dif? Connections-based Learning, Connected Learning, Connected Education, Global Ed. Any dif? Let's set the matter straight. We all have some intuition about the fact that the 21st-century connected world has opened doors to new ways of looking at teaching and learning. We all feel like there is potential to tap into. We might not know how to do it, but we often catch wind of something amazing going on. We are asked to make our teaching more relevant, more personal. We may not feel like we have the tools to do it, but we feel the pressure with this felt potential. We also know that this potential goes beyond simply what technology offers. It is the human element that makes the difference. It is not enough that online games are more engaging, that apps are more intuitive, that our devices are more powerful. We recognize that education is about the heart. Therefore, it is not about the games, apps and devices, but more the doors those games, apps, and devices open. What, in the end, do they do for us? And how do they help us get to a place of meaning. Really, in education these days, the question has to be: what matters? I have been trying to share an approach to teaching that can give us a framework regarding answering that question: forming learning relationships needs to be the foundation of learning. Learning must be based on making human connection. 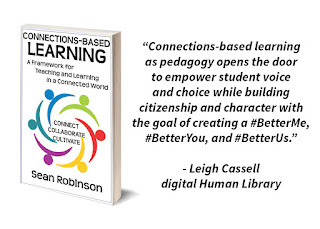 I have called it Connections-based Learning I also recognize that there are many terms out there that have been used to add meaning to the idea of connecting our classrooms. The first order of business should always be to define the terms. What I would like to do is to look at the terms surrounding connection in education to help us reach some common language. 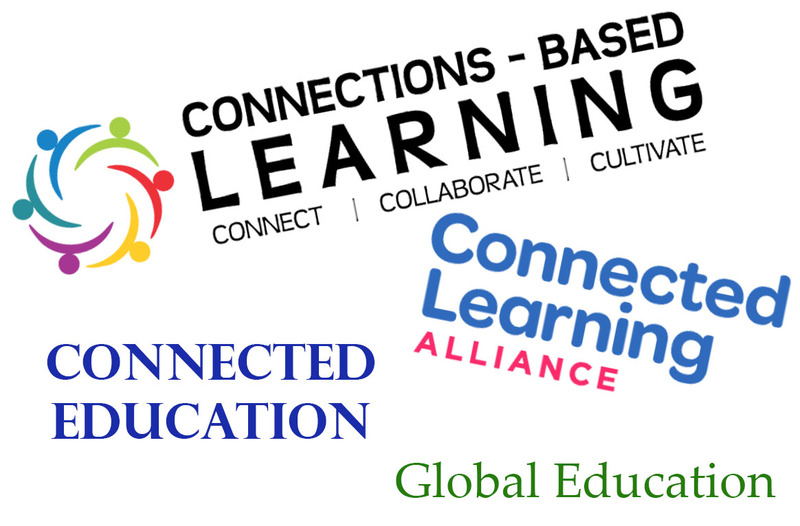 The terms Connected Learning, Connections-based Learning, Global Education, and Connected Education are not synonymous. They each have their focus and I will attempt to give each term a solid spotlight in order to clarify the connected landscape. Connected Learning: The power of making learning relevant from Connected Learning Alliance on Vimeo. Connected Learning is a type of learning based on student personal interest. Connected Learning - an agenda for research and design states that "Connected learning is realized when a young person pursues a personal interest or passion with the support of friends and caring adults, and is in turn able to link this learning and interest to academic achievement, career possibilities, or civic engagement." - (Ito, M. et al., 2013). It is a perfect marriage of peer involvement, interest pursuing, and academic engagement. The focus of the process is not on a certain structure (Ito, M. at al., 2013, p. 45), but more that students' learning happens in the context of pursuing shared interests and goals. It has a focus on educational reform which includes addressing and eliminating ethnic achievement gaps. The desire is to "bring together in-school and out-of-school learning and activity." and form deeper bonds between different spheres of learning. Connected Education has a focus on online learning activities. The term Connected Education was first used in conjunction with personalized learning in the form of online lessons describing the groundbreaking work of Paul Levinson and Tina Vozick. In the 80's, they created masters degree programs that could be completed online. The term Connected Education continues to be used to describe any kind of learning that uses the internet in some capacity. Here is a 2008 Connected Education video on digitizing lessons. The early focus on Connected Education was to have video lessons readily and easily available for learning. The term is still used very generally today. You can see that in the information gathered by the New York Times Learning Network in this post: What connected education looks like - 28 examples from teachers all over. "The mission of The Centre for Global Education (TCGE) is to educate 21st Century students for a 21st Century world by providing global learning opportunities, enhanced through technology, informed by sound research and innovative teaching." In Atlanta, Georgia there is The Consortium for Global Education. Their desire is to provide opportunities for students and teachers to help develop global worldview through school partnerships, student exchanges, and collaborative research. The Centre for Global Education in Belfast focuses on achieving a "just and equitable world". They remind us that part of Global Education is to influence leaders and policy makers, to support organizations that foster social and economic equality, and "to promote an understanding of the interdependency of people across the world." See: The Maastricht Global Education Declaration for more definitions on Global Education. The Wonderment: Guatemala Library Bus from The Wonderment on Vimeo. 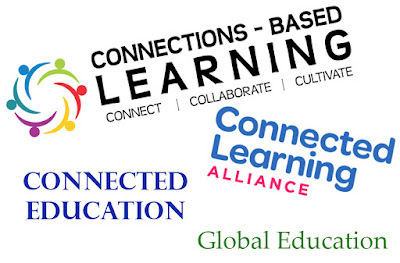 Connections-based Learning is an approach to teaching and learning that leverages the connected world by connecting students with their community, learning from experts, supporting organizations, or partnering with peers. While Connected Learning uses connection to support students' own interests, Connections-based Learning has connection running through every facet of the process. Connected Learning is a more free flowing process that harnesses a student's everyday experience while Connections-based Learning focuses on connecting students with learning or action partners. Connected Education includes utilizing apps to maximize learning; Connections-based Learning uses apps to promote connection to maximize learning. While Global Education often includes a true connection with others outside the classroom, Connections-based Learning must include a connection. Global Education looks out to find the needs of the world; Connections-based Learning looks around finding connection anywhere--from home and the community all the way to the ends of the earth. For Global Education, learning is focused on the world and its needs; Connections-based Learning could include learning about stem cells, or white water rafting, or Mars. The infographic below clearly shares the nature of Connections-based Learning. This infographic was created in collaboration with Leigh Cassell (see her amazing resource called the digital Human Library) who had a huge hand in the images, wording and focus of this resource. Clarity is crucial as educators. And without a common language, we are not truly communicating clearly. As connected educators, let's work together to achieve a common understanding as we seek to make better teaching and learning. Please share your thoughts! "Connected Learning". Wikipedia: The Free Encyclopedia. Wikimedia Foundation, Inc. Mar. 8, 2016. Web. Aug. 31, 2016. Europe-wide Global Education Congress (2002). The Maastricht Global Education Declaration. Maastricht, The Netherlands. Ito, M.; Gutiérrez, K.; Livingstone, S.; Penuel, B.; Rhodes, J.; Salen, K.; Schor, J.; Sefton-Green, J.; Watkins, S.G. (2013). Connected learning: An agenda for research and design (PDF). Irvine, CA: Digital Media and Learning Research Hub.